As we slowly wend our way through the graveyard, we continue to stop and to dig here and there, looking for the cultural roots or original inspirations buried beneath the various specters presented to us. We've just finished looking at the band and the hearse tea party, and earlier we looked at the mummy and the operatic pair. So what's say we wander over and take a look at the decapitated knight? Let's see, in our last post we were standing in front of the tea party, so if we cut across, the knight should be easy to find. See him? 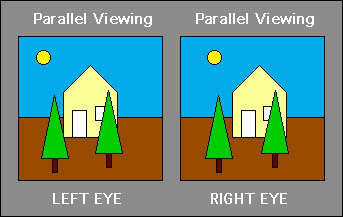 A head, over on the right hand. 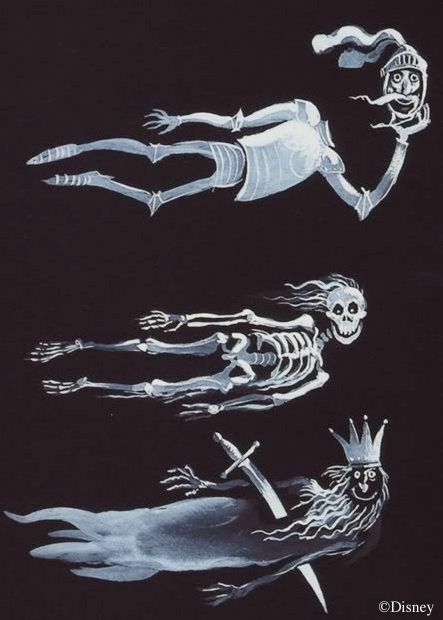 Some might think that the idea of a ghost carrying his head around is an original idea, or if not absolutely original, then an adaptation of the Headless Horseman from The Legend of Sleepy Hollow, a character thoroughly disney-fied in the 1949 film, The Adventures of Ichabod and Mr. Toad. But actually, these kinds of ghosts are quite traditional. There's a little lane in Wortley, England (near Leeds), where the ghost of a Yorkshire nobleman executed during the English Civil War is reportedly seen once or twice a year, carrying his head beneath his arm. 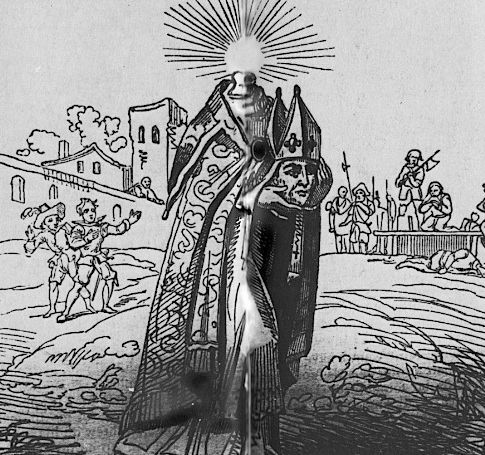 In 1760, it was reported that a headless priest was busily haunting a small village outside of Paris. The Christian martyr St. Denis reportedly scared the hell out of his persecutors by appearing as a ghost with his head in his hands and giving it the old boogity boogity boogity. Here's an 18th c. illustration. Wow. He looks ready to join the lineup at the Haunted Mansion (except that he's a clergyman, but we'll talk about that in a future post). There is actually a lively tradition of beheaded martyrs behaving in this way (they're called Cephalophores; a big hat tip to ttintagel for drawing my attention to these). 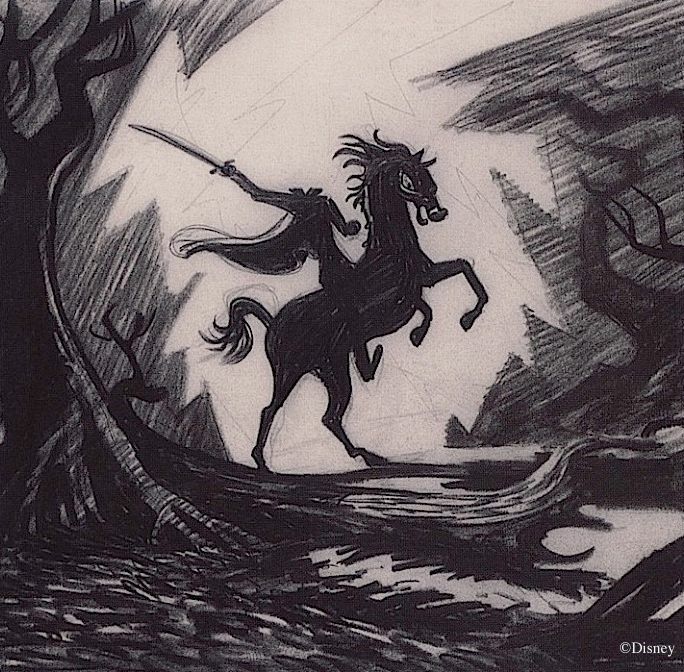 Between these firmly attested traditions of headless ghosts and the Sleepy Hollow connection, it's no surprise that both Ken Anderson and Marc Davis created a number of some-assembly-required spirits for inclusion in what became the Haunted Mansion. In fact, Anderson was going to make the Headless Horseman himself the star of the show in one version of his Ghost House. 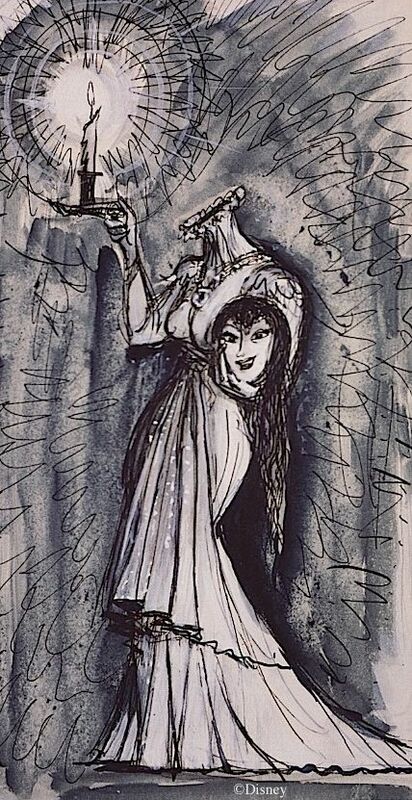 That looks like it could be concept art for the 1949 film, but in fact it's Anderson's sketch of the Ghost House version. The old pumpkin chucker wasn't going to have a monopoly on the gag, however. Anderson also wanted ghosts based on historical characters, and in one script he had Anne Boleyn running around screaming and falling down at the top of the stairs as her wailing head rolled on down toward us. Bumpity bump. (How cool is that.) In other scripts it was a bride character who had a hard time keeping her noggin in place. He also sketched what looks like a decapitated pirate. 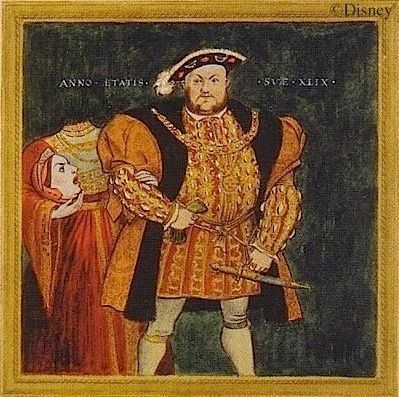 When Marc Davis took charge of things, he apparently liked the Boleyn character and dreamed up a changing portrait in which her husband Henry VIII is haunted by an understandably crabby Anne. 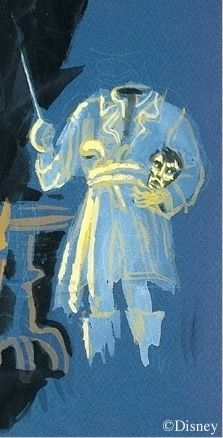 Then there's the Hat Box Ghost, and maybe Madame Leota. After all this, you might conclude that the decapitated knight was just another twist on the same gag. If Anderson could have a pirate; Davis could have a knight, right? No significance to the figure itself, right? I wouldn't be too sure about that. If you start probing for the origins of the "decapitated knight" figure, you strike paydirt right away. He goes back to Celtic mythology and shows up in medieval literature, most famously Sir Gawain and the Green Knight, which was written about 1350. When I was an English major in college (which was also in the middle ages), everyone was expected to read Gawain at some point. It was like Beowulf; like it or not, you couldn't avoid it. Nowadays I don't know if Gawain is still a regular on the college reading lists. 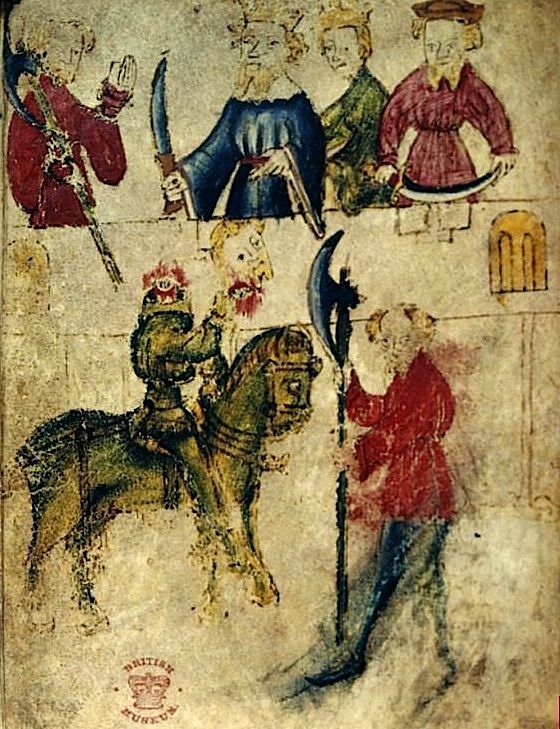 Here's an illustration of the beheaded Green Knight found on the original manuscript of Gawain, probably the most direct ancestor of our DL version. Note that he's holding it on his outstretched hand. A stranger shows up at the court and challenges them to behead him, on the condition that he be allowed to do the same at some future point in his own court. 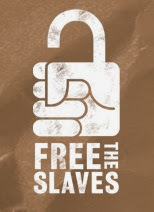 The hero of the tale accepts the challenge and beheads the stranger, who does not die but returns home. Later, the hero keeps his promise and goes to the foreign court, encountering numerous tests and trials in the process, opportunities for him to prove his chivalry, loyalty, honesty, etc. The stranger either lets him off the hook or goes ahead and beheads him, after which he cheerfully returns home, none the worse for wear. The most bizarre thing about this bizarre motif is how popular it was. Sir Gawain and the Green Knight is the most famous example, but the same motif is used in other medieval poems and romances going back to the 8th century—which is basically the same thing as saying that no one knows how old it is, since we start running out of literary sources about that point. Since the beheadings don't kill anybody in these stories, the presence of the beheading game immediately signals that the literature you're reading is fantasy or myth. Like I said, a popular interpretation is that it goes back to pagan Celtic mythology, probably something about the turning of the year, as the new year slays the old year, only to be slain himself after the passing of a year. Naturally, Freud has his own ideas what this head chopping is all about, and there is no lack of other interpretations. Sir Gawain is amenable to a Christian reading, for example. 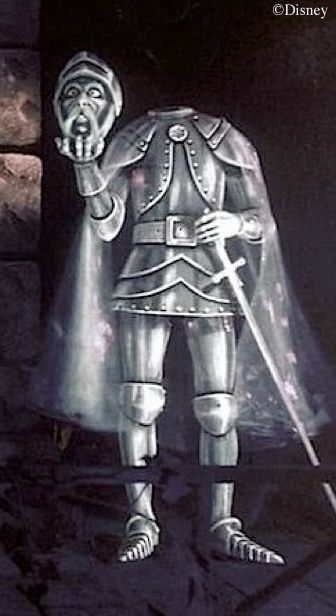 Point is, the decapitated knight as a fixture in Western consciousness is not rooted in ghost tales at all but in myth and fantasy. In his origins, he was not a frightening figure. 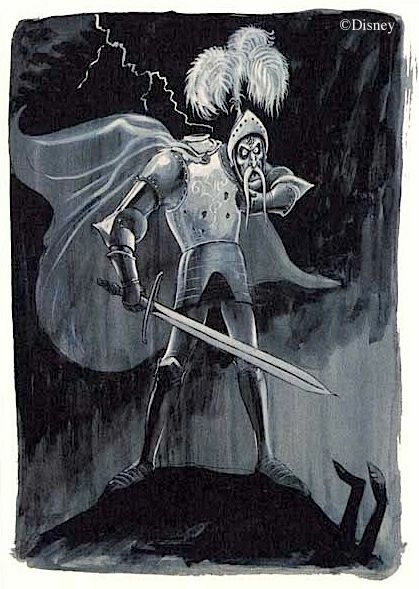 Maybe it's the fact that the knight is not just another random candidate for the "decapitated ghost" gag but the tip of a much bigger and older cultural iceberg that explains Marc Davis's unusual attachment to the character. One might even say stubborn attachment, for when you see the knight in his current graveyard setting you are seeing Marc's fourth attempt to get him into the Mansion. I'm not sure of the order of the other three attempts, so the following account is a little arbitrary as far as sequence is concerned, although there are a few flimsy clues. 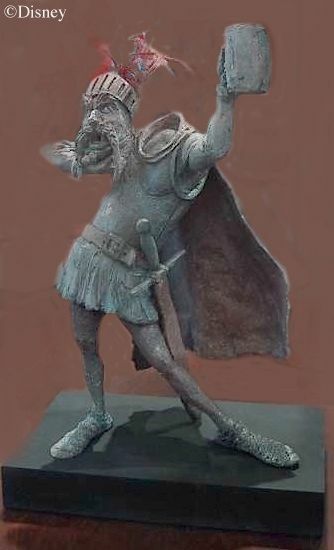 In what may be the original concept, Marc presented the knight as a very fierce, stand-alone character. Notice the dead guy in the background. Don't be that guy. Like I say, Davis evidently liked the character and re-submitted him as a possible hitchhiking ghost. 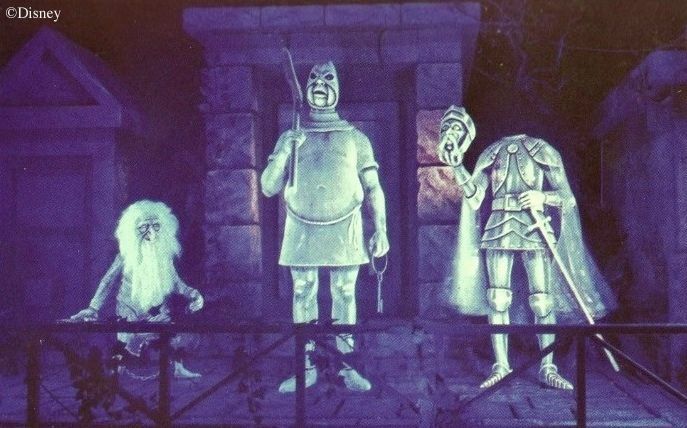 But the HHG gag that they ended up using plays off of the many urban legends about hitchhiking ghosts, who are never terribly distant in time from the unlucky folk who pick them up. You never hear about ghostly hitchhikers who are Roman soldiers or medieval monks, do you? For one thing, you wouldn't understand their language. The three HHG's in the HM are ambiguous: they are certainly a little old-fashioned looking, but not figures from remote antiquity. The decapitated knight wouldn't work as a HHG. 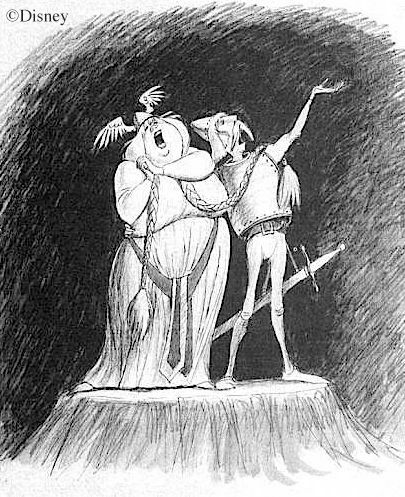 Well, goshdang it, how about the decapitated knight as an opera singer? Yeah, that's it, an opera singer. 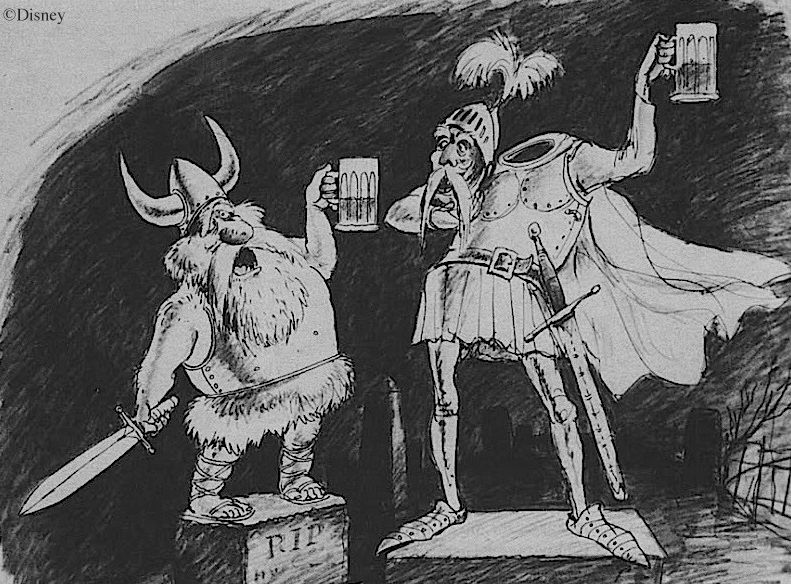 This 1968 drawing is labeled as an opera scene. Get it? "a knight at the opera." Oh, that Marc! This one may be his third attempt since it seems like it got a little further in the process: there's a maquette figure of the knight. The problem, of course, is that a much funnier opera pair also emerged from Marc's pencil, and there was no doubt who would get the gig. The jailer is already implicitly an executioner as well, what with that mask and all. Well, why not make him specifically a headsman? He could hold a keyring in one hand, and an axe in the other. That's it: make the duo a trio, with the central character relating to the one character as his jailer and to the other character as his executioner. By the way, can someone explain to me why he's always called the "headless knight"? What's that thing he's got in his hand? 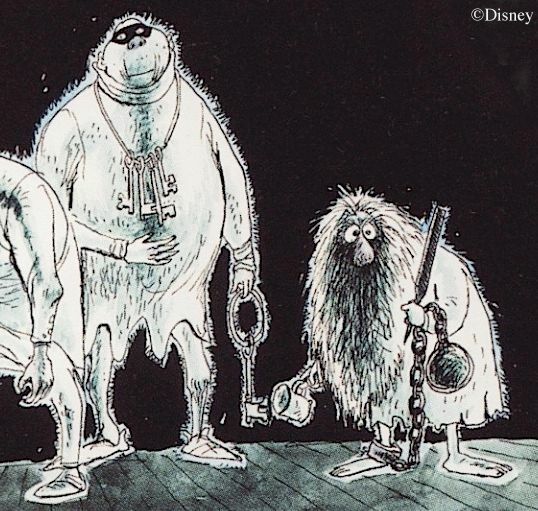 It's early concept art for the ghosts who "follow you home" in the mirror. Technically not hitchhikers, I suppose, but the same general idea.